CAT 2017 convenor Neeraj Dwivedi has confirmed that there won’t be any change in the CAT scores released on 8th January. Find all the details about CAT 2017 Results here. CAT 2017 Result announcement on 8th January brought smiles on the faces of many MBA aspirants, while many others had to face disappointment. But one controversy that has been reported in the leading media dailies regarding CAT 2017 results is with regards to anger and frustration among few CAT candidates over the normalization of CAT 2017 scores. To understand this in detail, let us examine in detail the controversy and all the aspects related to it. As per reports, this year CAT 2017 candidates have witnessed major difference between CAT 2017 score released by the test conducting authority i.e. IIM Lucknow and the raw CAT score calculated by the candidates. 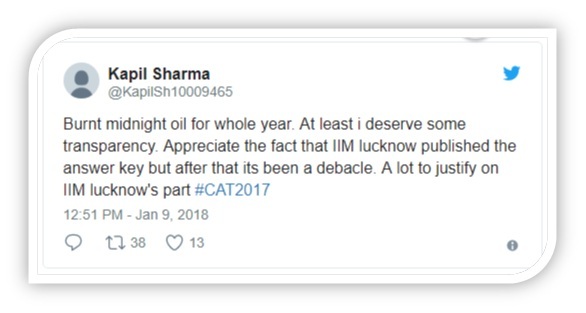 Many CAT aspirants who received their results this Monday took to twitter to complain about this discrepancy asking IIM Lucknow to take corrective measures. 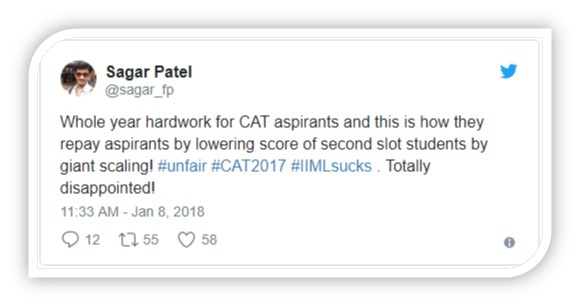 As can be seen the above tweets, many CAT 2018 candidates, especially those who had appeared for the MBA entrance exam in the second slot, have complained about their CAT 2017 scores being scaled up in a wrong manner. 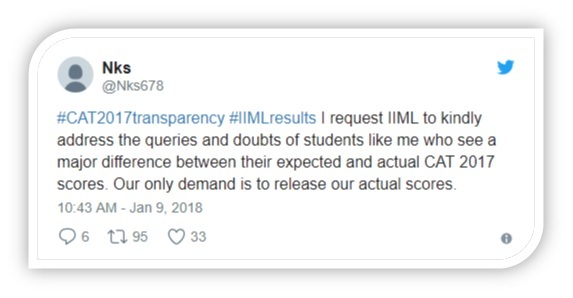 Along with the complaints, MBA aspirants have also demanded that IIM Lucknow releases the Raw CAT 2017 scores of all the candidates and also reveal the process through which they were scaled up or normalized. What is normalization of CAT 2017 Score? According to the general understanding, the CAT score that is released by the test conducting authority i.e. IIM Lucknow for CAT 2017; are normalized in order to ensure fairness and equality for all the appearing candidates. Through the normalization process, a fair chance is given to all candidates appearing for CAT exam, irrespective of their session or time slot. However, this normalization process, which is aimed at making the CAT scores fair have come under question in this year’s MBA entrance exam. The root cause of CAT 2017 score normalization controversy can be traced back to the new initiative of IIM Lucknow under which the test conducting agency decided to release the CAT 2017 answer key for the first time. IIM Lucknow also invited challenges to the CAT 2017 answer key before the announcement of CAT 2017 result. Based upon the answer key, many students were able to calculate their raw CAT 2017 scores and found the actual scaled up scores to be in stark contrast. Popular MBA test prep sites and social media forums related to CAT 2017 has seen consistent rise in the number of CAT 2017 candidates raising concerns about the normalization of CAT scores this year. Some students have also tried to reach out to the CAT 2017 helpline and IIM Lucknow directly, but have not received any clear response. Some candidates have also approached Ministry of Human Resource Development over the issue as it is a matter of grave concern as their future career is dependent upon their CAT 2017 score. Alternatively, few candidates are also planning to file an RTI (Right to Information) application as well to get their raw CAT scores. Despite the angry tweets and protests by some CAT 2017 candidates, IIM Lucknow has not let its guard down and decided to take forward the IIM admission process as planned earlier. Commenting upon the controversy regarding the CAT 2017 score normalization, CAT convenor Neeraj Dwivedi has said “A lot of students don't remember what they have answered in the examination and it becomes purely memory-based when it comes to calculating raw scores based on answer keys. In many cases the assumption is not correct.” He also added that ““We did have received a few emails from aspirants and we will be taking action as and when needed,” pointed out Dwivedi. As of now, IIM Ahmedabad, Bangalore and Lucknow have already started their admission formalities for the MBA programmes. Therefore, it doesn’t seem that the concerns raised by the candidates with regards to CAT 2017 scores would be addressed any time soon. But, if there is any update from IIM Lucknow we will keep you updated at mba.jagranjosh.com.